It was June '69 I think and Baradraj told me that they were going down to Boston to see Prabhupada who was coming there from the west coast. I accepted his invitation to accompany them in their VW microbus and we went. After a few days however Prabhupada still had not come. Baradraj and the other devotees went back to Montreal. I had no responsibilities in Montreal so I stayed in Boston to wait for Prabhupada's coming. With the approval of the TP - Satsvarupa Adhikari, I was shaved up. I also went out every with the Boston devotees on harinam to the Common though I wasn't wearing a dhoti. 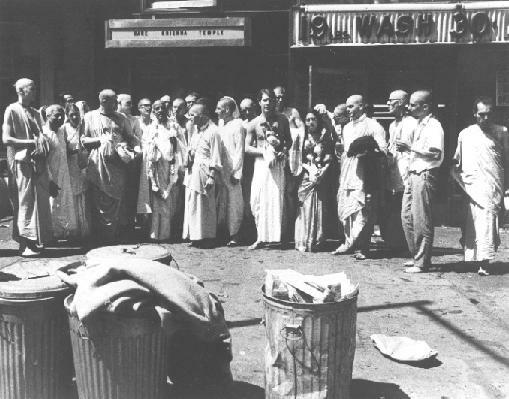 In those days standards were strictly followed: no-one dressed in any way could go on harinam with the devotees and you couldn't chant in any tune or play any instrument: it was dhoti or sari and mahamantra in the simple four-note "Happening Album " tune or its variations as chanted by Prabhupada ... and only karatals and mrdanga. An exception as far was made in my case as for my dress and I was told that I could accompany them every day if I wanted. After another few days the word came that Prabhupada wasn't coming to Boston after all but was coming to New York instead. All the devotees would be going in the one car available in which there was no room for me. So I set out to hitch hike, with little idea as far as an exact destination. After a half-an-hour or so at the side of the freeway trying for a ride with the sun beating down on my bald head, the devotees pulled over in their Corvair-with-the-seats-removed and took me in. I have never tried to analysed it much but that was real luck: the chances of spotting someone on the side of a busy freeway at 60 MPH don't seem very good. Maybe the fact that there were so many eyes peering over the dashboard and doors was in my favour. Anyway we made it to New York and went straight to LaGuardia - now Kennedy airport - to greet Prabhupada. The terminal was crowded with devotees and passengers. Real kirtan was going. After just a few minutes, Prabhupada glided through the arrivals gate. For the crowd of passengers I could only see the top of his head. The next scene I clearly remember was Prabhupada seated with all the devotees and myself, bowed down around him. As I raised my head and looked up at him, he was looking directly at me. Not just looking at me, but seeing past my present body, seeing myself as I myself did not know myself... in some past life I felt. This all lasted a few seconds. Fresh kirtan began. I don't remember details after that with the next thing I clearly remember is again seeing and hearing Prabhupada giving class or his arrival talk at the 66 Second Avenue temple it must have been an hour or so later. I touched his soft slipper-clad lotus foot as he walked past my bowed form after his talk. Any previous doubts as to my identity were gone from my mind. My real identity: devotee/servant of Prabhupada-Krishna. So simple.